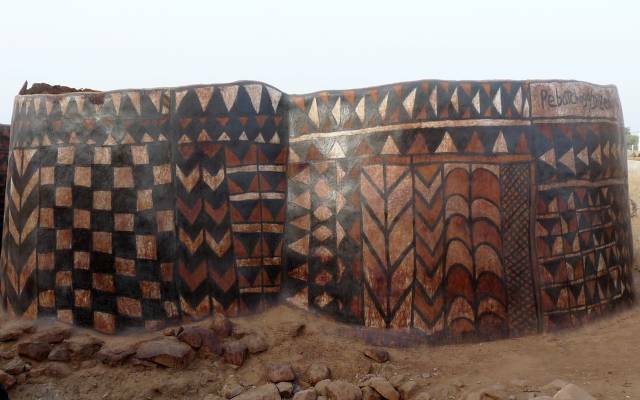 Almost nothing is known about life in present-day Burkina in prehistoric times. There is evidence that in the northwest of the modern state hunter-gatherers would have lived about 14,000 years ago. 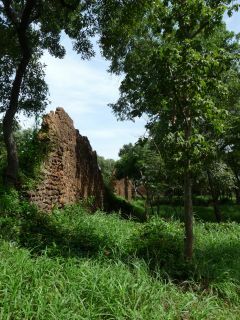 In the southwest the ruins of Loropeni were discovered, which became Burkina’s first UNESCO World Heritage Site. Already in the first millennium AD various ethnic groups including Gourounsi, Bobo and Senoufou lived in this area. From the beginning of the 12th century significant migration movements took place, which brought along important changes. As a result, the two Mossi kingdoms were founded at the end of the 15th century. These highly civilized states for a long time defended themselves successfully against the attacks of other intruders and Islamization. In the 18th and 19th centuries other groups migrated into what is now Burkina Faso, Lobi and Dagara came from Ghana and Ivory Coast, respectively, and settled down in the southwest of the country. In 1896, the French arrived and claimed the area. The Mossi kingdom of Ouagadougou was defeated and the country became a French protectorate and then, in 1904, part of French West Africa. During the French colonisation a number of uprisings took place. In 1915, a revolt initiated by the Bwa broke out. It was put down by the colonizers, after bloody battles, which saw hundreds of Bwa killed. In 1919 the region was renamed Upper Volta. As Upper Volta was economically insignificant millions of workers were sent to the neighbouring colonies of Ivory Coast and Mali where they were used as forced labours for working on road and railway construction. During World War II many of them fought for France. In 1932, Upper Volta was dissolved and split up between Ivory Coast, French Sudan and Niger.During colonial times, cotton was introduced by the French. Initially, it was used to supply France’s textile industry. It is still the mainstay of the economy today. In 1958 Upper Volta became an autonomous republic in the French community and on 5 August 1960 it received full independence from France. Maurice Yaméogo became president of the First Republic. In 1966 he was overthrown in a military coup led by Colonel Sangoule Lamizana. In November 1982, a military coup led by a group of young officers brought Major Jean-Baptiste Ouédraogo into power.But there was an internal political struggle within the group and it was bitterly divided into different camps. These disagreements and Sankara's leftist rhetoric led to his arrest. The release effort, directed by Captain Blaise Compaoré, resulted in another military coup d'état on 4 August 1983. After the coup, the National Council for the Revolution (CNR) was formed and Sankara became head of the state. Sankara carried out far-reaching changes. He introduced a new administration structure and all land was nationalised. He also established an impressive programme of social welfare reform which included vaccination campaigns, the improvement of education and housing construction and the advancement of women’s rights. Dams and wells were constructed and Sankara fought against corruption. In 1984 he renamed the country Burkina Faso – meaning the land of upright people. While the international reputation of the charismatic leader grew, his domestic authority diminished. Internal political conflicts led to a bloody coup d’état that killed Sankara on October15, 1987. A new military junta took over the government headed by Captain Blaise Compaoré, who is said to have plotted the assassination of Sankara. Compaoré intended to “rectify” Sankara’s revolutionary course. But due to the global political change in the late 1980s and early 1990s he has been obliged to adopt a more democratic course. In June 1991 a new constitution was proclaimed, political parties were again permitted and authorized to take part in elections. Blaise Compaoré has been to power for more than two decades until today. The majority of the Burkinabe population practises traditional beliefs. At the same time, many of the animist people retain traditional beliefs alongside Christian and Muslim religion. 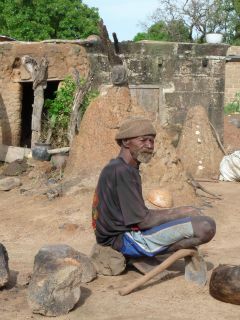 Islam dominates in the north of the country, particularly among Fulani and Tuareg, but also many Mossi are Muslims. An estimated 50% of Burkina’s population are Muslims. According to statistics, Christians make up 10%. The majority of the Christians are Catholics. 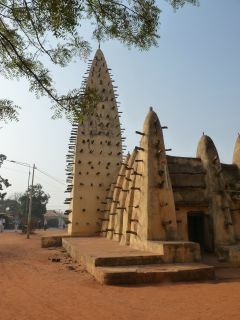 The Archbishop’s residence is in Ouagadougou. Protestantism is also practised widely. There is a large level of acceptance of the various religions amongst each other and most ethnic groups are religiously heterogeneous. French is the official language of Burkina Faso. There are three further national languages, which are Moore (the language of the Mossi people), Dioula and Fulfulde. Dioula has developed to an important trading language and is spoken throughout West Africa. In Burkina Faso it is most widely used in the southwest and northwest. Fulfulde the language of the Fulani and it is widely spoken in the north of the country. The country’s name contains three languages: Burkina is a moore word, that means honour or dignity, Faso means fatherland in Dioula. Together they mean “Land of the honourable”. A person from Burkina Faso is called Burkinabe. The –be ending is the Fulfulde plural term for children or people. A large number of other languages are spoken in Burkina Faso, most of them belong to the Gur or Voltaic group of the Niger-Congo family of languages. They include Lobiri, Senufo, Gourmanchema, Gourounsi, Dagara, Tusyan, Birifor and Bwamu. There are also languages belonging to the Mandé group of languages including Bissa, Marka, Samo and Bobo. The Tuareg in the north of the country speak Tamaschek. Roughly 1700 plant species occur in Burkina Faso. The semiarid Sahelian zone predominantly contains small shrubs, spiny plants, grasses, succulents, acacias such as acacia Senegal, tamarisk trees and jujube (Ziziphus mauritania), which produces small fruits beloved by Fulani and Tuareg. The Sudano-Sahelian zone, that lies south to the Sahelian belt, is dominated by the strange baobab (Adansonia digitata), mango (Mangifera indica), karité (Vitellaria paradoxa), nere (Parkia biglobosa) and neem (Azadirachta indica).The red silk cotton tree (Bombax ceiba) is also found in the dry savannah. This tree is native to tropical Asia and has beautiful red to orange flowers, which appear when there are no leaves. The kapok or silk cotton tree (Ceiba pentandra) with its impressive buttress-roots is also common. The African mahogany, also known as cailcédrat (Khaya senegalensis), is found towards the south of the region. It is a tall tree (up to 30m) with a dense crown, which is used for building boats or furniture. There are different species of palm-trees in Burkina Faso: the doum palm (Hyphaene thebaica) and the ronier (Borassus aethiopum) grow in the savannah. Oil palms (Elaeis guineensis) are cultivated in the area around Banfora. The Sudanian zone in the south of Burkina Faso contains Senegalese rosewood (Pterocarpus erinaceus) and afzelia (Afzelia africana). In southernmost part of the country there are some dense forests such as the Forêt de Koulbi. Four of the “Big Five” occur in Burkina Faso: elephant, African buffalo, leopard and lion. There are four national parks and wildlife conservation areas in the country including the W National Park, the Arly Reserve, Nazinga Ranch and Deux Balés Park, which offer good opportunities to view the “Big Four”. The best chance of seeing them is in the W National Park. This park is also the last refuge of the cheetah in West Africa, but the chances of encountering it are very slim. It is said that one pack of the African wild dog, one of the continent’s most endangered animals, survives in W. Along with smaller cats and spotted hyenas, the common golden and the rare side-striped jackal are found in the parks. The world’s largest land mammal, the elephant, is regularly seen around the watering holes of Nazinga Ranch and Deux Balés Park. Burkina Faso is home to various antelope species including roan antelope, Defassa waterbuck, hartebeest, bushbuck, kob antelope and different members of the duiker family. Among the primates, the most often spotted are baboons and vervet monkeys in addition to patas. The warthog is a popular sight across Burkina‘s game-parks, which are generally organised in family groups. The hippopotamus is easily seen on the watering holes of the national parks and on lakes or ponds throughout the country. The hippo lakes of Bala near Bobo and Tengrela close to Banfora offer good opportunities to view Africa’s most dangerous land animal. Burkina Faso is an excellent place for birders. 496 species have been recorded, although relatively few species are resident (about 20%). The national parks offer good opportunities to watch birds, but they are generally only open in the dry season between November and May. During the rainy season roads are often inaccessible. Among Burkina’s bird species are: Abdim’s stork and other stork species including black stork and saddle-billed stork, Abyssinian roller, black kite, various heron and egret species including black-headed heron, great egret and cattle egret, Abyssinian plover, a number of eagle species such as African fish eagle and other raptors, lappet-faced vultures, Namaqua doves, glossy starlings, owls and more. Enthusiasts should use a field guide to birds of West Africa. Crocodiles are commonly encountered in the parks of Burkina Faso, as well as around lakes and pool throughout the country. 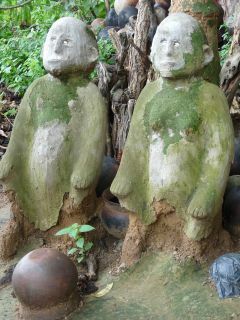 They are held sacred by locals. Among the snakes spitting cobra, black and green mamba and puff adder are widespread, but they are very shy and unlikely to be seen. 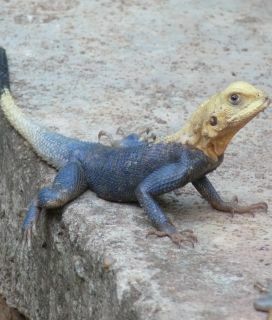 Other reptiles commonly seen in Burkina are lizard, agama species and the common house gecko. Burkina Faso covers an area of 274.200 km². It is bordered by Ghana in the south, Ivory Coast in the southwest, Mali in the north and west. In the east lies Niger, and to the southeast Benin and Togo. Burkina Faso is a relatively flat country. The average altitude is 400 m. The country consists for the most part of a vast lateric plateau in the West African savannah, which covers three quarters of Burkina's surface and forms a gently undulating landscape. The southwest of the country, on the other hand, forms a sandstone massif, where Burkina's highest peak, Tenakourou, is found at an elevation of 749m (2.457ft). 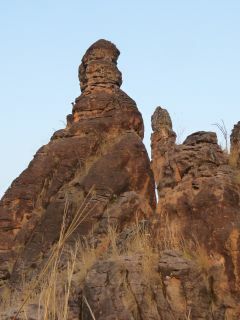 The massif stretches from northeast to southwest between Bobo Dioulasso and Banfora and is bordered by cliffs up to 150m. In the southeast near the border with Togo, the smaller Sobmangou massif rises to around 100m, dominating the plateau. The three largest contributing branches of the Volta River, the Black Volta called Mouhoun, the White Volta called Nakambé and the Red Volta called Nazinon rise in Burkina Faso. The country owes its former name of Upper Volta to these three rivers. The Pendjari is another important river. It makes up part of the border between Benin and Burkina Faso. The Pendjari National Park owes its name to the river. Along with the Black Volta, the Comoé River is the country's most important river rising in the surroundings of Banfora. 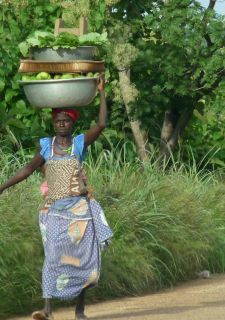 Burkina Faso is highly dependent on agriculture, with substantial employment and income arising from subsistence farming. About 90% of the workforce is employed in this sector. The most important agricultural products are millet, maize, sorghum, fonio, rice, yams, manioc and sugar cane. Cotton is the mainstay of the economy. It accounts for more than 50% of the export revenue. Alongside cotton, groundnuts and, to a smaller extent, gold and manganese make a contribution to exports. Like Mali and other cotton-producing countries in West Africa, Burkina Faso suffers from the fall in world cotton prices and the subsidy support that the US and Europe give to their own farmers. The country also exports livestock to neighbouring countries. The industrial sector is small. It is worth to mention the food processing and textile industry, vehicle assembly and a motorbike factory, as well as a brewery and an oil mill. The service sector is mainly in the hands of the Lebanese community. The majority of the population operates in the informal sector. This is why the government loses a lot of tax revenue.